WEST LAFAYETTE, Ind. — Hoosiers should keep their umbrellas and flashlights handy because the thunderstorms that have marked spring, especially early June, likely will continue until the end of July. 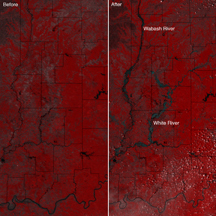 Infrared satellite images of southern Indiana show widespread flooding of the White and Wabash rivers. The image on the left was taken on May 28, before the record rainfall, and the image on the right was taken on June 10. The images have a resolution of approximately 275 yards (250 meters). Purdue University’s Terrestrial Observatory captured the images from NASA’s MODIS-Aqua satellite. La Niña’s control of the weather pattern will continue to make Indiana’s normally severe storm season more intense and generate storms more frequently than average, said Dev Niyogi, state climatologist and an assistant professor of agronomy and earth and atmospheric sciences at Purdue University. La Niña is a name given to the interaction of the atmosphere with cooler than normal sea surface temperatures in the tropical Pacific. This impacts global weather patterns. The cool ocean surface temperature and recent precipitation deluge tell climatologists that La Niña still has some punches to throw, he said. La Niña could be the major reason for the weather pattern responsible for 9.85 inches of rain in Gosport in Morgan County on June 7. Edinburgh, Ind., has the rainfall record for the week of June 2-8 with 17.94 inches and also for a single day with 9.95 inches on June 8. According to the National Weather Service, precipitation of this magnitude is considered a 1-in-1,000 year event. Although the current La Niña is coming to an end, Niyogi said that it’s likely the weather will continue to be wet all summer. But it’s difficult to predict amounts of rain or exactly where it will fall, he said. Many of those factors came together over the southern third of the state during the first two weeks of June, he said. The effect was that a weather pattern of thunderstorms with heavy rain formed over that large area of Indiana and caused flooding. So much rain on already saturated ground, left water with nowhere to go except into homes, businesses and fields that quickly took on the appearance of new swimming pools and lakes.